When it comes to finding the hidden secrets about air travel, there’s no one better to turn to than a tried-and-true expert. And not just an expert, but someone who’s paid to find problem areas in the airlines’ performance. Brent Bowen is America’s leading airline critic — and frequent air traveler — who has uncovered a few secrets on how to find the right carrier for you, how to avoid pain on your flight, and how to understand those obscure rules of air travel. Bowen is an Embry-Riddle Aeronautical University professor, and he publishes the Airline Quality Rating, a report we’ve sometimes written about on this blog. And the fact that he still flies shows that he’s figured out several secrets, which means he has less-eventful flights and is able to relax more while he’s on the plane. The bottom line is simple: if you don’t make an informed decision about your travel plans, someone else will, and chances are that “someone” will be the airline. Their main concern is getting you from point A to point B safely; it’s up to you to do it in comfort and style. So here are some of Bowen’s secrets for having a more comfortable flight. Finding the right airline for you is key. You need one that fits your needs and budget. Do you need early seating? Do you want to avoid extra fees? Or is seat room a big concern? Dealing with an airline directly may give you more control over seating preferences, so research tickets and loyalty perks before you settle on one for the foreseeable future. Next, know the rules. Air travel has become complex and most folks are unaware of the recent surge of fees and restrictions currently held by airlines. Be aware of the rules, especially with “low cost” carriers, who will often make up the lost ticket costs with additional fees. Look for deals and chances to avoid fees, such as joining an airline’s loyalty program or buying your ticket with one of their points-earning credit cards. Whenever possible, Bowen says, fly nonstop as stopovers increase chances of lost luggage, delays, or other misfortunes. You only have one flight to contend with, so if there are any delays, you’re still going to get to your destination. But if you have a multi-leg flight, one late flight can throw off the entire trip. If nonstop is not an option, then avoid checking a bag. 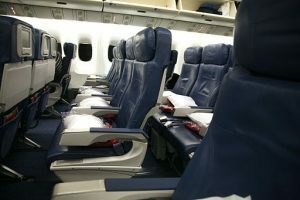 Try to purchase a better seat to avoid the middle seat/back of plane (choose the upgrade to Economy Plus). And check the airline’s website and see if you can choose your seat in advance. If you’re traveling for business and these options fall outside your corporate travel policy, see if you can make your own arrangements, and request reimbursement later. Alternatively, it might be better to take a longer trip than one with additional stops. What are some of your air travel secrets to make sure you arrive in comfort? Road warriors, what tips have you learned that we could all benefit from? Share them on our Facebook page, or on our Twitter stream.